Dr. Sun started her medical career as a neurologist in China. She obtained her Ph.D. in neuroscience in Japan. She completed her neurology residency training at the Medical University of South Carolina in the United States. She completed a cognitive and behavioral neurology fellowship at the VA Boston Healthcare System in the United States. Her research activities have been primarily focused on Alzheimer’s disease and related disorders. Her earlier work includes characterization of biochemical properties of tau protein in the axonal transport and roles of amyloid protein in Alzheimer’s disease. She is one of the earliest researchers to establish quantitative amyloid ELISA in the field. Her long-term efforts are dedicated to identifying biomarkers for the diagnosis of Alzheimer’s disease. Currently, she is working on the role of CSF synaptic proteins in cognitive function. She has been invited to be a reviewer for multiple journals on Alzheimer’s research. Dr. Sun provides clinical care to patients with cognitive disorders at the Memory disorder clinic of the University of Miami. She is also involved in educational programs for medical students, neurology residents, and is the Education Director for the Evelyn F. McKnight Brain Institute at the University of Miami. 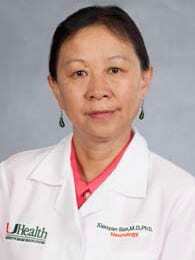 She is a co-director of the brain endowment bank in University of Miami Miller School of Medicine.